To demonstrate how smart an octopus can be, Piero Amodio points to a YouTube video. It shows an octopus pulling two halves of a coconut shell together to hide inside. Later the animal stacks the shells together like nesting bowls — and carts them away. “It suggests the octopus is carrying these tools around because it has some understanding they may be useful in the future,” said Amodio, a graduate student studying animal intelligence at the University of Cambridge in Britain. But his amazement is mixed with puzzlement. For decades, researchers have studied how certain animals evolved to be intelligent, among them apes, elephants, dolphins and even some birds, such as crows and parrots. years ago, the ancestor of today’s cephalopods lost the external shell. But all the scientific theories fail when it comes to cephalopods, a group that includes octopuses, squid and cuttlefish. Despite feats of creativity, they lack some hallmarks of intelligence seen in other species. “It’s an apparent paradox that’s been largely overlooked in the past,” Amodio said. He and five other experts on animal intelligence explore this paradox in a paper published this month in the journal Trends in Ecology and Evolution. For scientists who study animal behaviour, intelligence is not about acing a calculus test or taking a car apart and putting it back together. Intelligence comprises sophisticated cognitive skills that help an animal thrive. That may include the ability to come up with solutions to the problem of finding food, for example, or a knack for planning for some challenge in the future. Intelligent animals don’t rely on fixed responses to survive — they can invent new behaviours on the fly. To measure animal intelligence, scientists observe creatures in the wild — watching a dolphin stick a sponge on its beak to avoid getting cuts from sharp rocks and coral, for example. Or they bring animals into the lab and offer them puzzles to solve, such as rewarding crows when they learn to rip paper into strips of just the right size. Only a few species stand out in these studies, and by comparing them, scientists have identified some shared factors. The animals have big brains relative to their body size, they live for a long time, and they can form long-lasting social bonds. Those similarities have led to some promising explanations for how certain animals evolved to be smart. One is known as the ecological intelligence hypothesis. It holds that intelligence evolves as an adaptation for finding food. While some animals have a reliable food supply, others have to cope with unpredictability. Tools allow animals to get to food that they couldn’t reach otherwise. And if they can make plans for the future, they can store food to survive hard times. Other researchers have argued for what’s known as the social intelligence hypothesis: Smarter animals “cooperate and learn from other members of the same species,” Amadio said. Together, these forces appear to have encouraged the development of bigger, more powerful brains. Smart animals also tend to live for a long time, and it’s possible that bigger brains drove the evolution of longevity. It takes years for juveniles to develop these complex organs, during which time they need help from adults to get enough food. Cephalopods behave in ways that certainly suggest they’re highly intelligent. An octopus named Inky, for example, made a notorious escape recently from the National Aquarium of New Zealand, exiting his enclosure and slithering into a floor drain and, apparently, out to sea. Cuttlefish can scare off predators by forming eyespots on their bodies in order to look like giant fish. But they only use this trick against predators that rely on vision to find prey. If a predator that depends on smell shows up, the cuttlefish are smart enough just to flee. 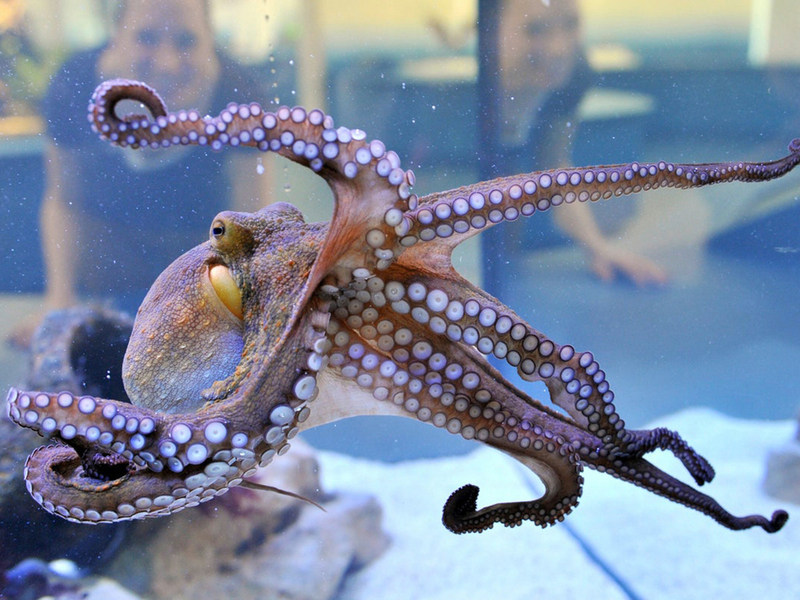 Octopuses show the same flexibility when scientists bring them into labs. In one study, researchers at Hebrew University presented octopuses with an L-shaped box with food inside. The animals figured out how to push and pull the morsel through a tiny hole in the wall of their tank. Another feature that cephalopods share with other smart animals is a relatively big brain. But that’s where the similarities appear to end. Most of the neurons that do the computing, for example, are in the octopus’ arms. Most strikingly, cephalopods die young. Some may live as long as two years, while others only last a few months. Nor do cephalopods form social bonds. They get together to mate, but males and females don’t stay together for long or care for their young. While chimpanzees and dolphins may live in societies of dozens of other animals, cephalopods seem to be loners. Amodio and his colleagues think the evolutionary history of cephalopods may explain this intelligence paradox. About half a billion years ago, their snail-like ancestors evolved to use their shells as a buoyancy device. They could load chambers in the shell with gas to float up and down in the ocean. A cousin of cephalopods, the nautilus, still lives this way. Like cephalopods, it has tentacles. It also has a somewhat enlarged brain, although it doesn’t seem to be anywhere as intelligent as an octopus. About 275 million years ago, the ancestor of today’s cephalopods lost the external shell. It’s not clear why, but it must have been liberating. Now the animals could start exploring places that had been off-limits to their shelled ancestors. 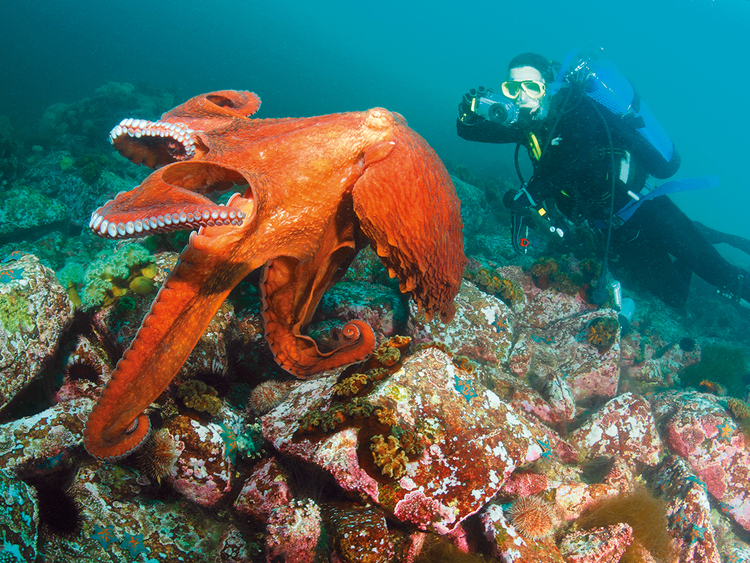 Octopuses could slip into rocky crevices, for example, to hunt for prey. On the other hand, losing their shells left cephalopods quite vulnerable to hungry predators. This threat may have driven cephalopods to become masters of disguise and escape. They did so by evolving big brains, the ability to solve new problems, and perhaps look into the future — knowing that coconut or clam shells may come in handy, for example. Yet intelligence is not the perfect solution for cephalopods, Amodio suggested. Sooner or later, they get eaten. Natural selection has turned them into a paradox: a short-lived, intelligent animal. Amodio said that scientists still need to learn a lot more about cephalopods before they can know if this hypothesis is sound. But the research may do more than shine a light on octopuses and their cousins: It could give us a deeper understanding of intelligence in general. It holds that intelligence evolves as an adaptation for finding food. While some animals have a reliable food supply, others have to cope with unpredictability. Smarter animals “cooperate and learn from other members of the same species.” Together, these forces appear to have encouraged the development of bigger, more powerful brains.